I went into Hopetoun on the weekend. The sample of the Shaker style kitchen door was Polar White, so we were able to see what that looked like with the bench. It looks great with the Osprey. We'll tone down our glass splashback to Dulux Limed White Half so there's less contrast between it and the cupboards. 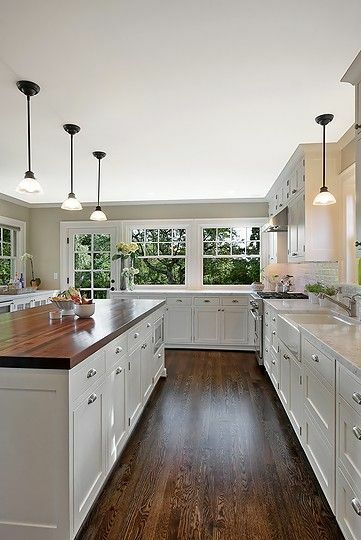 I love this kitchen (below) and it has the cool white cupboards with the warm beige walls and darker floors. Walls in this picture are darker than what we are having - but we could always paint the kitchen walls a darker colour to get this effect - maybe even the same colour as our backsplash - Limed White Half.